For the sake of saving time, I thought I would combine the final packing practice for Canna and Elephant Ears. Besides, I don’t think I can actually type the words Canna and Elephant Ears one more time. The process is pretty much the same for both plants. 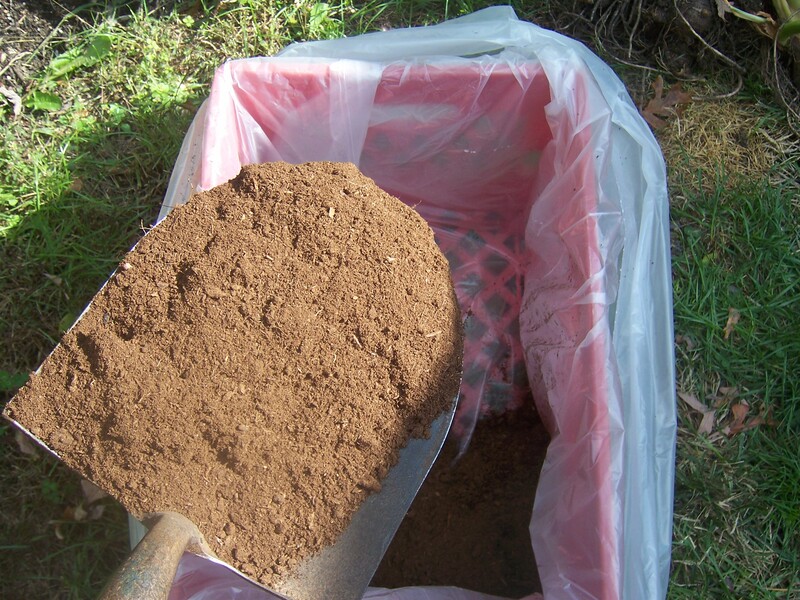 You will need peat moss, some kind of storage container (like brown paper bags), a shovel, and a room that stays relatively dry and evenly cool so that the plants can be lulled into a deep sleep without freezing. 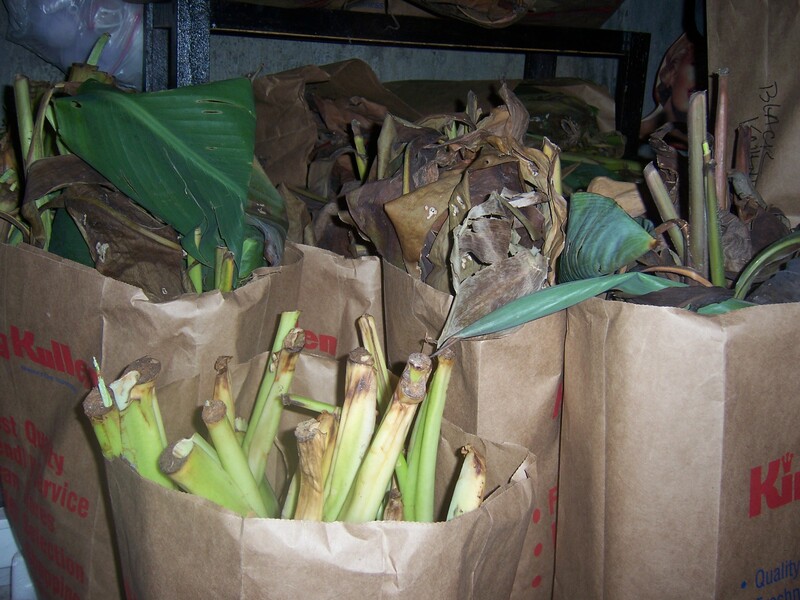 If the final storage location is too damp or warm, the plants never get a chance to rest and they are at risk of rotting away — and after so much work getting to this point, that would be a shame. 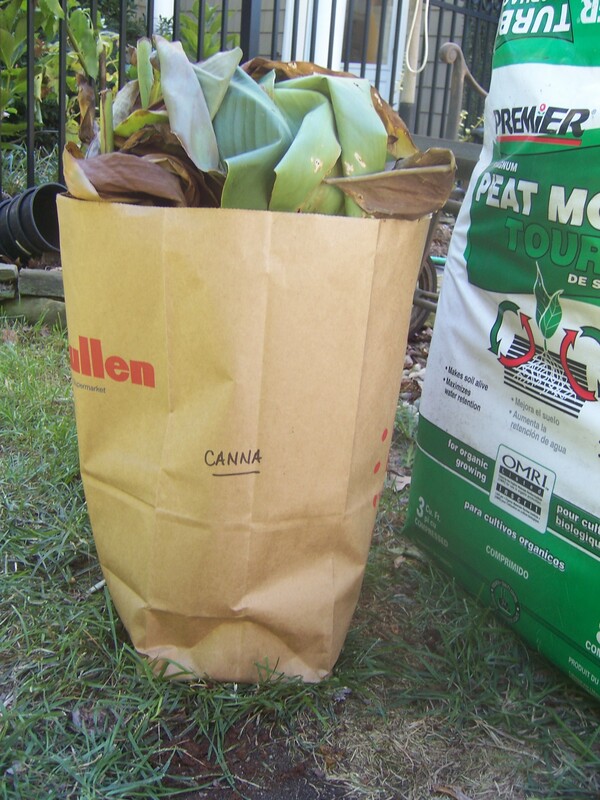 Step 1: Where Canna are concerned, I double up two brown paper bags and label the outside. 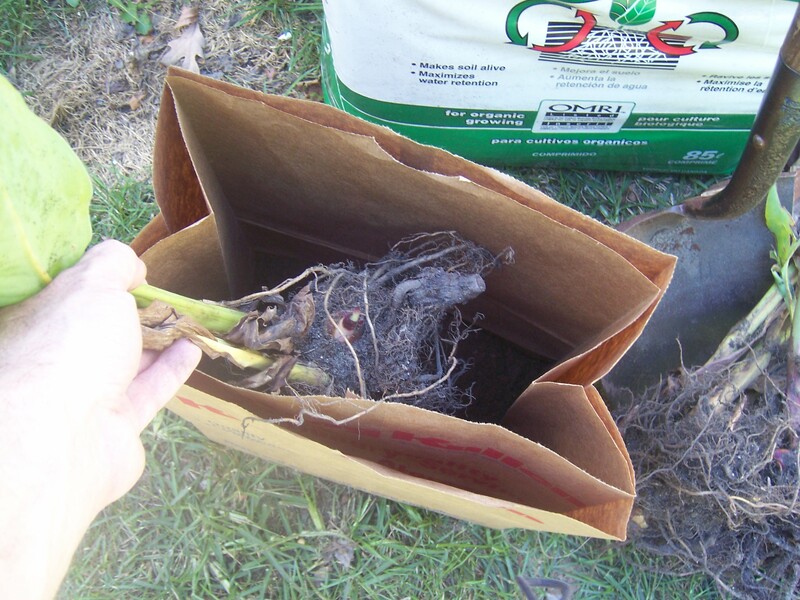 I then put a shovel or two of peat moss in the bottom of the bag so the corms have a nesting area. Step 2: I then place the corms (stem and all) into the bag. Step 3: I tend to really pack the bags. I’m not sure if this is correct, but it’s likely that I do this for the sake of space, since I have so many corms to pack away. 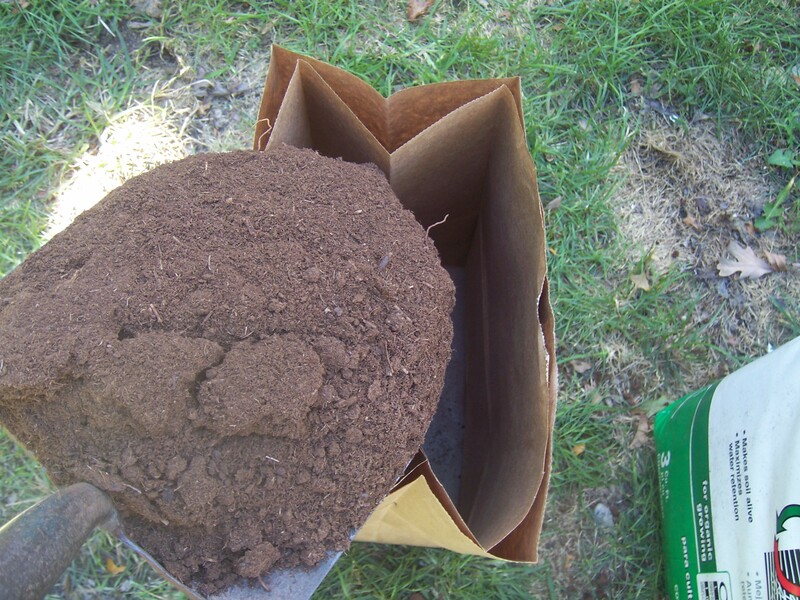 Once the bag is full, I then add more peat moss to the bag, shaking the bag so that the peat moss settles and covers the corms. Step 4: Finally, I have something that looks like this. Now for the Elephant Ears. Last year, I stored the Elephant Ear bulbs in a plastic crate lined with a plastic bag. I’m not sure if this had to do with my loss of energy and wanting to finish the task, needing to save space, or just running out of bags. Either way, it worked. 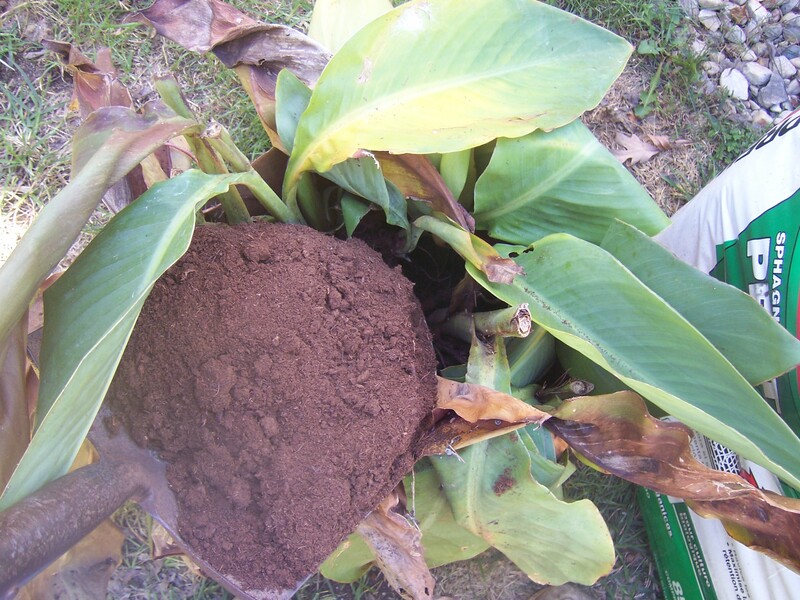 By the way, don’t be surprised if your Elephant Ears have continued to grow since you dug them up. Step 1: Once the crate is lined with a plastic bag, add a few shovels of peat moss into it to give the bulbs a place to rest. 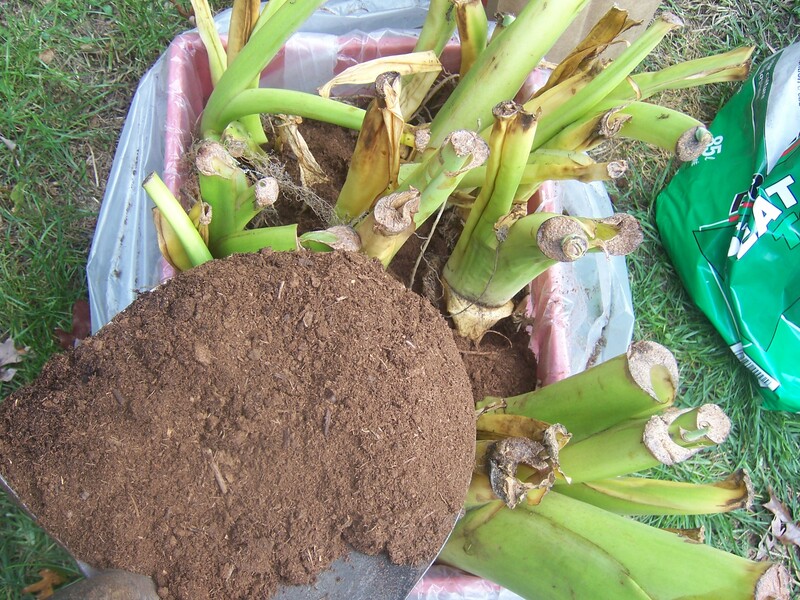 Step 2: Load the Elephant Ear bulbs (stem and all) into the peat moss-filled crate. Again, I tend to pack a lot in there. Then add peat moss to cover the bulbs. Step 3: Ultimately, this is what I am left with. All that’s left to do now is carry everything into its Safe Room. The Final Step: Here is the Safe Room — a cement bunker/bomb shelter hidden behind Joe’s closet in the bedroom. Now, anyone who knows me or who has read previous posts understands that I have an active imagination. As my summer plants continue to live, enclosed behind the closet, my mind races back and forth between Edgar Allen Poe’s Fall of the House of Usher and the classic sci-fi film Invasion of the Body Snatchers. So far, the Safe Room is protecting Joe and me. So far. 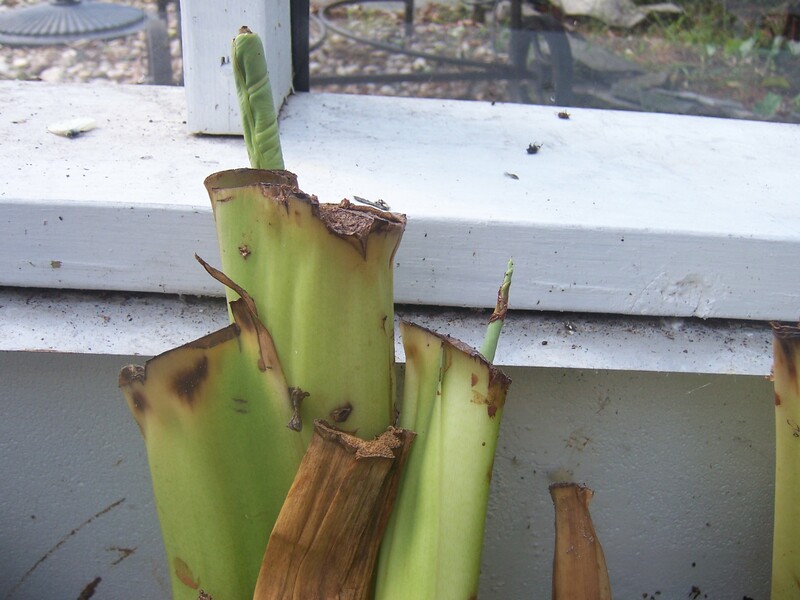 . .
And the elephant ears and canna must act as sentinels as well! I appreciate your sharing this method. I want to add some elephant ears to the garden next year, and now I know how to overwinter them. Great post. Your procedure seems a lot like what I do with my dahlia bulbs although I have had quite the time trying to find a good ‘safe room’. My dahlias were too warm last year and started growing in February in their boxes. oops. Thank you. The safe room is critical. 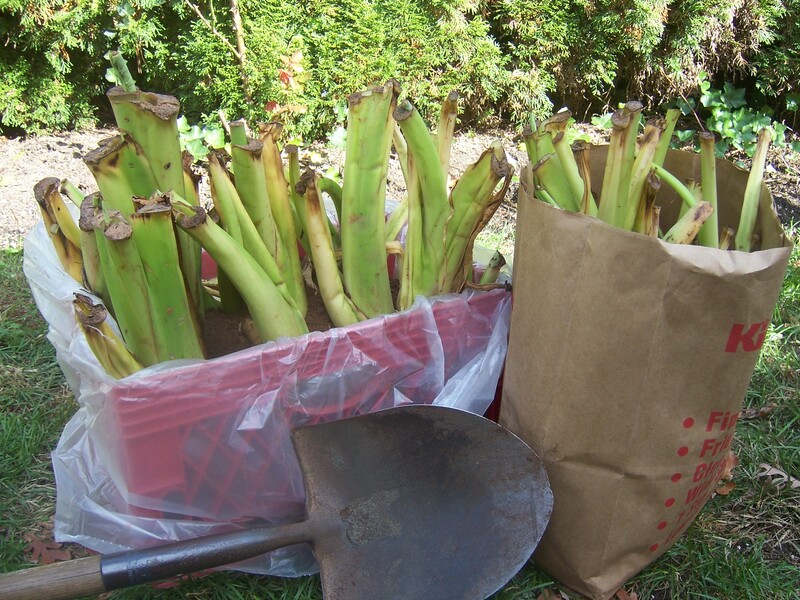 I learned that the first year when my Canna corms turned into a bag of smelly mush while overwintering in the garage. Not a pleasant smell for spring, that for sure! I am rather thankful that I don’t have to go through this yearly process here in my 7b garden; mainly because I can never remember where I planted those darned tubers after they die back into the ground. The cannas have fought my well-meaning attempts to keep them safe in winter, preferring to quietly remain underground under layers of mulch, while taking over the rest of the garden. I look forward to the day when they can stay in the ground, and my only task will be to dig and divide. Thank for visiting!